On Nov. 9, 2018, doctors, veterinarians, scientists, and politicians arrived at Boston’s Colonnade Hotel to celebrate trailblazing AIDS researcher Max Essex. Harvard T.H. Chan School of Public Health along with the Harvard T.H. 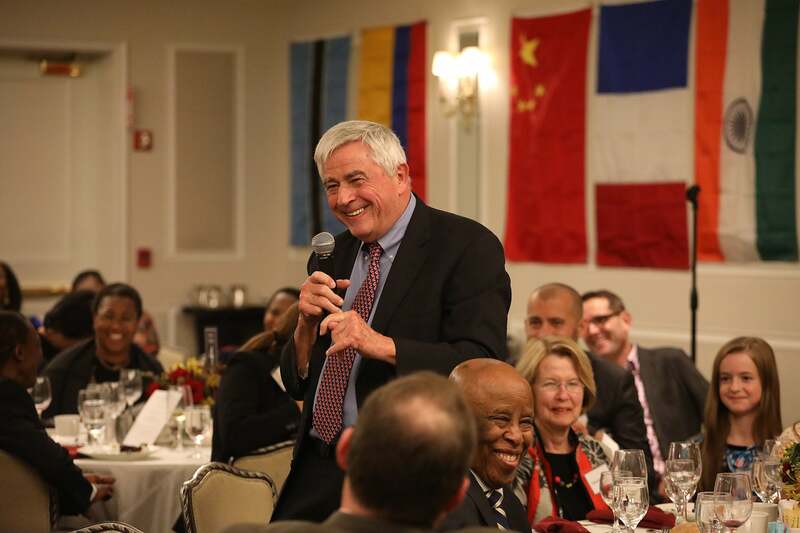 Chan School of Public Health AIDS Initiative, hosted the scientific symposium to honor Essex, the Mary Woodard Lasker Professor of Health Sciences, as he prepares for retirement. Essex’s career spans more than four decades and is punctuated by impressive achievements at every point along the way. In the early 1980s, he was among the first scientists to hypothesize that a retrovirus was the cause of AIDS. His research was instrumental in creating the first widely used HIV-blood screening test, and he helped establish both the Harvard AIDS Institute (HAI) and the Botswana–Harvard AIDS Institute Partnership. During welcoming remarks, Phyllis Kanki, professor of immunology and infectious diseases at Harvard Chan School, noted that Essex has been an influential educator and mentor who’s trained dozens of doctoral research students and many more postdoctoral fellows. In addition, he has authored or co-authored more than 600 peer-reviewed papers. “Don’t worry, we’re not going to go through each of them,” Kanki joked. The symposium did, however, trace the evolution of Essex’s scientific endeavors and showed how far his influence continues to reach. It featured sessions and presentations from Essex’s colleagues, mentees, and collaborators. Sue Cotter, distinguished professor emeritus at Cummings School of Veterinary Medicine at Tufts University, recalled Essex’s formative years, when they were working together on feline leukemia. Their work took them into homes with dozens of cats and revealed that feline leukemia was in fact contagious and associated with immunodeficiency — findings that would inform Essex’s early work on AIDS. Among the highlights of the symposium was discussion of the high-impact work of the Botswana–Harvard AIDS Institute Partnership, a collaboration between the Ministry of Health in Botswana and HAI that began in 1996. The program, which established a state-of-the-art laboratory in Botswana, has helped carry out critical epidemiologic work in the country and launched ongoing projects aimed at curbing mother-to-child transmission of HIV, understanding resistance and adherence to antiretroviral drugs, and conducting genomic analysis of HIV-1C, the viral subtype predominant in southern Africa. Festus Mogae, who was president of Botswana from 1998 to 2008, recalled the severity of the AIDS crisis in his country when he took office. “In the absence of assistance, we faced extinction,” he said. He commended Essex not only for his scientific accomplishments but also for his commitment to building local capacity by training health care workers and scientists from Botswana and surrounding countries. “I’m proud that there are so many Africans that now know as much about the science of HIV and AIDS as you do,” he said.